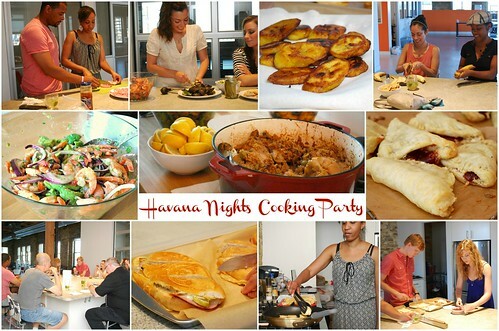 In Cuban cuisine, guava is a common and popular fruit. In many Cuban kitchens, it won't be surprising to find a tin of guava paste because it's commonly used as a spread for breakfast just as many use jams and jellies. Guava paste is much denser and can easily be cut into slices or wedges, then slathered on toasted bread. 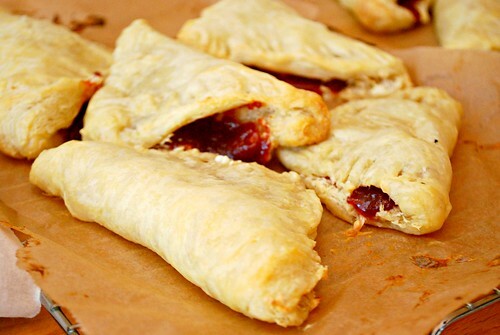 In Cuban bakeries, you'll even notice how guava is used in pastries like in this recipe. To find guava paste, look in Latin markets and some supermarket chains do carry them too. They will either come packaged in a round tin or plastic container, or sometimes in a long brick. 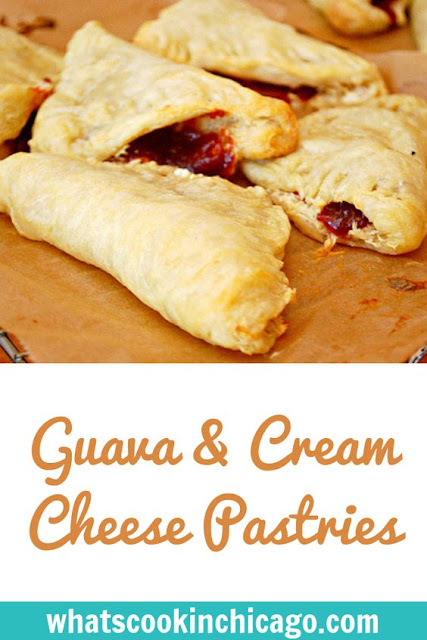 Cut the guava paste and cream cheese into 1 inch pieces. Set aside. Lightly dust a clean, smooth surface with flour. Roll out the thawed pastry dough. Have a small cup of water handy to moisten the edges if needed. Cut the dough into nine squares. (18 if you are using both sheets of dough). Place a piece of guava and a piece of cream cheese on each square. Take the corner of each square and fold it over, forming a triangle. Press down on the edges so the triangle stays closed. Place all pastelitos on a cookie sheet lined with parchment paper. Bake for about 10-15 minutes or until golden. Ya had me at "pastries"
That looks delicious! I love guava! That just looks and sounds delicious! I wonder where I can find some Guava! our store is so not culture friendly. I have never heard of guava paste but ti sounds good. I'm not a fan of cream cheese, but this looks yummy! Oh my gosh these sound amazing! I will definitely have to give these a try. Thanks so much for sharing! Oh wow, those look amazing!! I love cream cheese. I love pastries! Oh goodness, I just love the whole thing! Those pastries look really fresh and soft! These look delicious! The recipe sounds simple too, love that! These look super YUMMY!! I can't wait to try them great recipe! I'm so glad you warned us about Ice Cream Day tomorrow. We had ice cream (well, frozen yogurt) last night, but I'll have to make sure to include some tomorrow too. Oooh, those look good! I just might have to give them a try! I just made some applesauce banana bread, but this will have to go on my list to make as well! Thanks for the recipe! Wonder how it tastes, guava paste and cream cheese? Very interesting, it looks delicious too!